Wow. That’s all I can say about our time at the Newport Folk Festival this year. 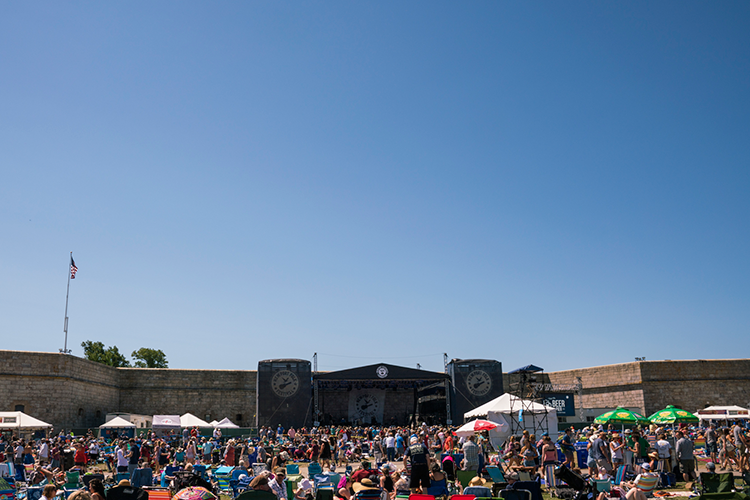 For those of you that don’t know, the Newport Folk Festival is a music festival taking place over a long weekend at Fort Adams, right on the harbor in Newport, Rhode Island. The setting is New England at its peak. 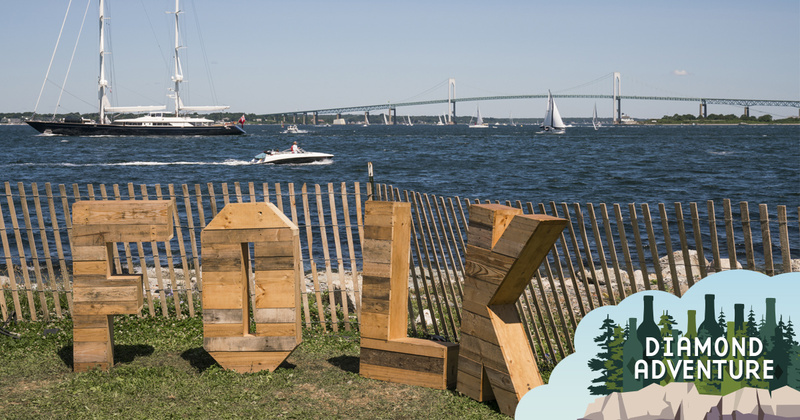 The backdrop to the festival looks like a painting you’d see in a comfortably quaint Bed and Breakfast – a suspended bridge in the distance over a harbor full of the most beautiful sail boats you’ve ever seen, their sails swaying in the wind, shrouded by the most polite seagulls you’ve ever met. Add a sunny day into the mix and it’s as if you can hear “This Land is your Land” constantly playing from the deepest depths of the sea. This is what I would call America: The Beautiful. For nearly 60 years, this festival has been drawing people from all around the country to come and spend three days on a beautiful island with like-minded people, enjoying the music, enjoying the discourse and taking a break from real life. Although this festival began as a true American folk festival with early headliners such as Bob Dylan (that’s another story for another day), Pete Seeger (a founder) and Joan Baez, for the past 30 or so years the music hasn’t necessarily been what you would categorize as folk, so much as celebrators of American music. Musicians with love and appreciation for many disparate types of music to come out of America in the first half of the 20th century. Rumor has it that the larger than life organizer of the festival, Jay Sweet (whose love for this festival just emanates from his being for the entire weekend and who somehow makes it to almost every single set), wanted to make sure that the festival could remain relevant without losing its true Americana roots. So today, it’s music that brings a lot of people and counter cultures together to celebrate peace, love and resistance. And, at the end of the day, there are plenty of banjos and mandolins on stage too, so it’s not veering intensely off course. It seems to be more-so at a wonderful cross section of folk, rock, roots, jazz – so much that makes American music great. In fact, some might say we are at a great point in time for a revolution in Americana music (see unscheduled, surprise act Nathaniel Rateliff and the Night Sweats or the exquisite Ms. Margo Price). We were there with our friends at TuneIn Radio as a presenting sponsor of their live stream of the festival. If I were to recount the entire festival, we would be here all day, so I wanted to give you a few of my personal highlights from the weekend – and suggest to you that if any of this sounds appealing to get your hands on tickets for 2018 sooner rather than later…for the past five years, tickets have sold out before the line-up has even been announced. 1. If you google Newport Folk Festival 2017, one of the first things that is going to come up is a surprise Roger Waters coming out onto stage to perform with John Prine, the festival’s closer.Although there were some rumblings around the grounds that this might happen and Lucius(who tours with Roger Waters and I cannot say enough good things about) came out on stage to perform just hours earlier – it still brought tears to my eyes to see Waters come out and Mr. Prine for a quiet, soulful rendition of “Hello in There.” Sunburnt shoulders swayed in the crowd as the sunset turned the sky pink and orange. Prior to Waters appearance on stage, Prine was graced with the likes of Margo Price, Jim James (who made his way into at least 25% of the sets this weekend), Justin Vernon and Nathaniel Rateliff. Although Mr. Prine and Mr. Waters made a fine team on-stage, I’d say that it was Prine and Price that seemed to be made for each other. Together they sung “In Spite of Ourselves,” and you might have thought that Price, with her raspy, but ethereal country notes, had been the one Prine had in mind when he wrote the track. The set concluded with a beautiful rendition of “Paradise,” featuring what seemed to be every artist from the weekend who performed. 2. If you didn’t know, I’m born and bred in Philadelphia and will defend it until the day I die. I still think it’s the best city in the world and helping my cause is the band helping to define the music of it’s time, Dr. Dog. For those of you who aren’t familiar with them, I would suggest getting familiar. Their sound is tricky to describe – maybe if Brian Wilson, the best church choir you’ve ever heard in your life and The Old 97s had a love child. So essentially the best. Their entire catalogue is pretty incredible, but they just released a new LP called “Abandoned Mansion,” and there’s one song on the album that I could (and do) listen to on repeat all day. It’s called “Survive” and it’s a bright, sunny sounding piece of music with a crazy drum beat that makes your entire body move unconsciously and a circular guitar riff that makes you want to dance around with daisies in your hair – all behind lyrics that describe growing into life as an adult in the most heartbreakingly relevant way. Watching them perform this track, I cried, I laughed, I moved. I lived. The entire band is compelling to watch on-stage and the energy from the crowd is something that I can’t even begin to describe in words. If you ever get a chance – go see these guys. 3. The Avett Brothers covered Black Hole Sun as a tribute to one of the greats we’ve lost this year, Chris Cornell. It was certainly an emotional moment at the festival and made it even clearer that this festival is about so much more than the music – it’s about how all of these different genres of music have made every single one of the people on that stage and in the audience feel like they belong at some point in their life when they otherwise felt outcast. It’s about building a community on being different, interesting and embracing who you are. I can’t imagine there was a dry eye in the crowd. The brothers shared vocals on the song and honestly did more true justice to the late Cornell’s vocals than I would have anticipated, forgoing their normally upbeat staccato stylings for sludgier, grittier, more dark and sinister vocals and ultimately jamming through to the end of the song. That’s something I won’t easily forget. 4. Final day of the festival - I woke up with a mild headache due to a late night watching Deer Tick perform to a tiny room full of adoring fans. But, I had made a promise to myself that I would get up with enough time to catch the ferry and go see the Berklee College Gospel Choir – a perfect way to start a Sunday. They were pretty amazing and as I was leaving their set, I was met with one of my all time favorite sounds – a brass band. So I followed the sound like a fly to honey and found The Preservation Hall Jazz Band. I have never met a stage full of horns and strings that I didn’t like and this was no different. These guys have been around since the early 60s with a continually rotating lineup. It’s traditional New Orleans jazz – the kind that makes you want to stomp your feet, pop your hips and smile at the stranger across the bar. After an hour of these good vibrations, that little headache was long gone. I think I’m going to have to start listening to these guys every Sunday morning. 5. Making new friends – that’s what festivals are all about after all. New friends, new conversations, new connections. I was happy that we finally got to meet our friends at TuneIn and help them live stream the event so even if you couldn’t make it to Newport, you could listen in on your couch, your desk, wherever! 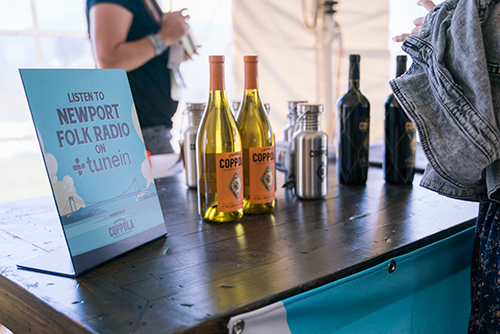 You can still listen to Newport Folk Radio here. Another thing I would be remiss not to mention is that this festival is part of Newport Festivals, a non-profit that “fosters the legacy and expands the impact of its Festivals through educational initiatives that celebrate innovation while preserving the deep traditions inherent in Jazz and Folk music.” With arts education constantly on the chopping block, it’s so important to have organizations like this to help craft the next generation of creativity in America.